“Near a highway overpass and a short walk from the central receiving bay of the Port of Keelung, just below a massive rock face”. These are not the directions you’d normally give to find a magical temple, but Keelung, if anything, is the city of surprises. 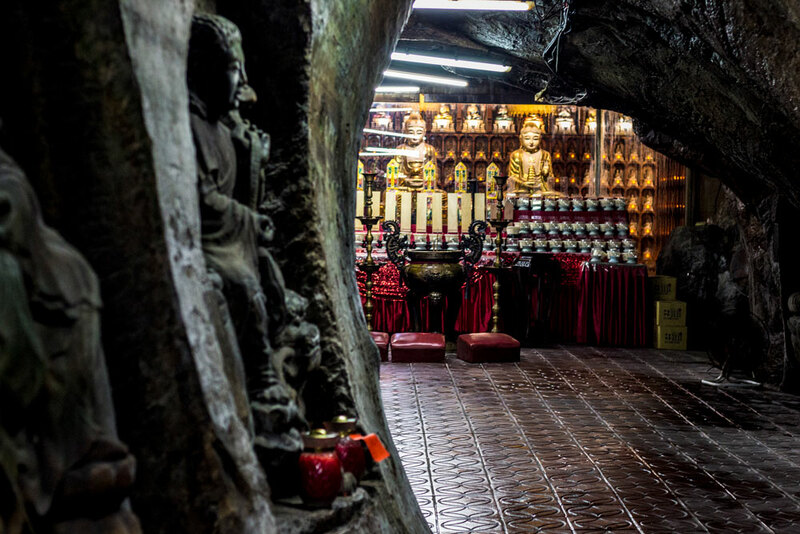 From the outset, this small local temple doesn’t boast the most impressive Buddhas or most vibrant art, but we came to Taiwan to discover something different, and stories of the Fairy Cave fit that bill. The temple itself is carved into shear rock called tidal caves and Xiagdong takes advantage of the natural shapes of these caves to create paths and places of honor for a wealth of Buddhas. Everywhere you turn you'll find images carved directly into the walls or small statues placed in out of the way alcoves. Once inside, by staying toward the left, you’ll see a hole in the cave walls just large enough to fit a person into. This is the small cave of Xiangdong and like Keelung itself this small passageway is full of surprises. Every wall of this incredible path is carved with Buddhist kōan’s, poems and wisdom from poets long since past. Each note on the cave's walls varies with depth of carvings, quality of line, and age, which when combined create an a window into a world of the temple's faithful. Heading toward the back of the small cave, soon your movement will become restricted, as the walls and ceiling both squeeze in tight. To move forward without crawling on your knees you’ll likely end up in a squatted hoping position or a low crab walk. Though we had the temple to ourselves when we visited, you'd do well to announce your presence before heading down the path as navigating around someone heading in the other direction is would likely require some serious effort. Eventually the walls recede the cave's path opens into a small room, where the smell of incense and moisture mix in a most magical way. For the truly adventurous, take the time to hunt down the Hidden Buddha of the small cave. Standing less than 30 centimeters tall and tucked away inside the small cave pathway, finding this statue is never easy. Not far from Taipei’s modern beauty or the sheer wealth on display in Taichung is the small port city of Keelung. At first glance, Keelung isn’t likely to be your first destination in planning a trip to Taiwan, but if you make the time, a visit to Keelung will stick with you for a long time. We’ve already mentioned that Keelung has on of the best night markets in a country with incredible night markets, but Keelung is a city full of surprises and one we highly recommend you explore.